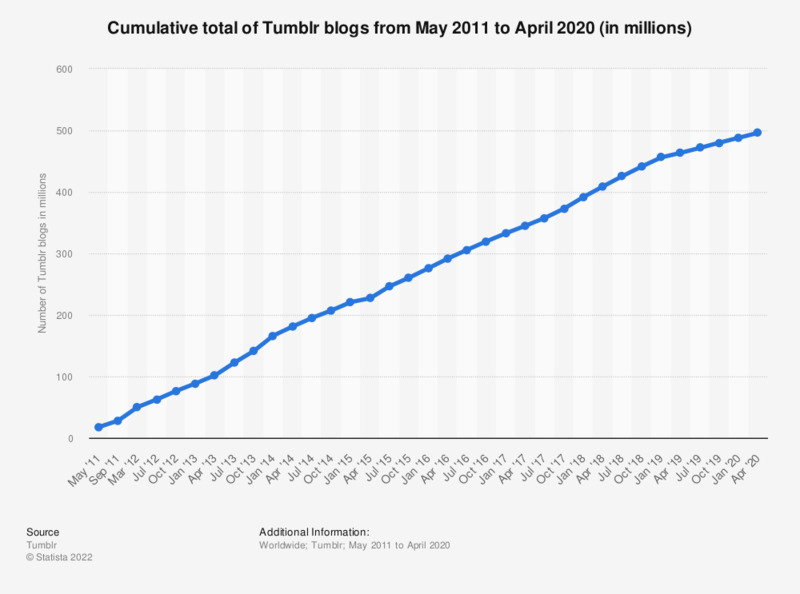 This statistic illustrates Tumblr.com's cumulative total blogs from May 2011 to April 2019. As of that month, the social networking site had close to 463.5 million blog accounts, up from 409 million in the corresponding period of the previous year. Founded in February 2007, Tumblr is a microblogging website and social media platform that is now owned by Yahoo. The website allows users to post images, videos, links and other media content to a short-form blog. Users can follow each other as well as access and post blog content via the platform’s user dashboard. As of April 2019, over 171.5 billion Tumblr posts have been generated on the social network. The social network accounts for less than two percent of total social media website visits in the United States, and has a user base consisting mainly of teen and young adult internet users. Despite the relatively low audience reach, Tumblr is a popular platform for online fandom discussions regarding music, movies and TV shows. Similar to Instagram, Tumblr is also set to take advantage of social media marketing by providing an ideal platform for visually-oriented brands in the retail and media sector. However, Tumblr adoption among marketers has been slow, and as such, Tumblr remains a niche marketing channel. Figure from September 2011 were taken from this TNW article, May 2011 and March 2012 figures from this TNW article. Everything On "Tumblr" in One Document: Edited and Divided into Handy Chapters. Including Detailed References. How trustworthy do you consider blogs?